Residents should please note that property owners are not required to comply with this By-law by altering a water installation or part thereof which was installed in conformity with a previous version of the By-law. Only when it comes time to replace toilets and showerheads due to age or malfunction must new parts that conform with the revised standards be fitted. All automatic flushing cisterns fitted to urinals must however be replaced immediately with either manually operated systems or properly maintained non-manual apparatus which causes the flushing device to operate only after each use. This is especially common in public facilities , e.g restaurants and shopping centers. Residents are also reminded that the following sections of the Water By-law have been in place since 2010, and will remain in place even when water restrictions are eventually lifted. (a) Major water users (those using more than 10 000 kilolitres per annum), excluding those comprising multiple dwelling units, must undertake an annual water audit. The audit must be carried out no later than two weeks after the end of each financial year of the City (i.e. 31 July every year). The audit report must be available for inspection by officials from the Department of Water and Sanitation, the Water Board (where applicable) and the City. (xi) estimate of consumption by various components in use such as appliances and terminal water fittings. 16. No person may allow water, used as a heat-exchange medium in any equipment or plant and supplied from a water installation, to run continuously to waste except for maintaining a prescribed level of total dissolved solids in a recirculating plant. Residents are also reminded that they are prohibited from negligently allowing water to run to waste on their property. In order to prevent this the City advises that residents perform regular leak checks. A DIY guide for finding and fixing water leaks can be found on the City’s website, www.capetown.gov.za/thinkwater, as well as a host of other useful information for households looking to reduce water consumption. ‘I would like to assure residents that all amendments made to the By-law have been included to strengthen the resilience of our built environment to the effects of water scarcity and ultimately protect our ability to safeguard public and environmental health. Compliance frameworks like By-laws are critical to a society’s ability to look after its residents and their interests. Such interventions form an important component of our broader efforts to live more sustainably,’ said Mayoral Committee Member for Informal Settlements, Water and Waste Services; and Energy, Cllr Xanthea Limberg. 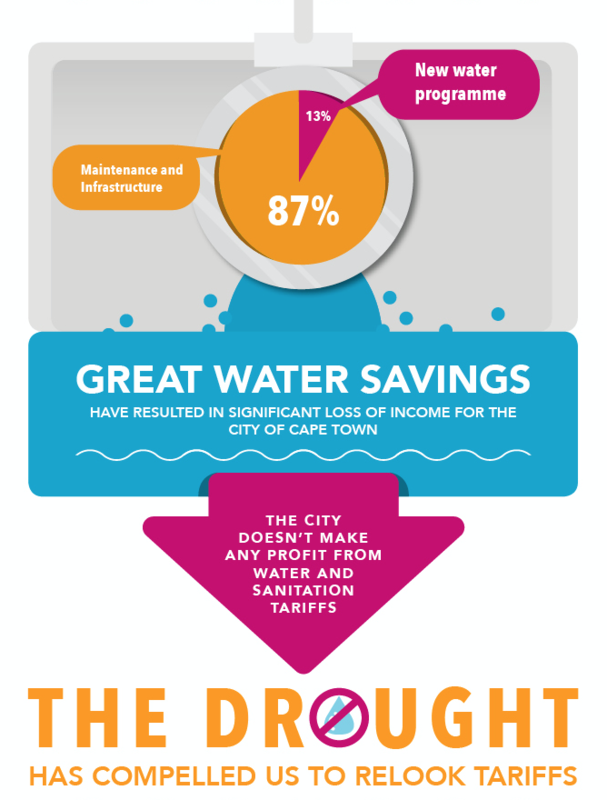 Given the current uncertainty around future rainfall patterns in the Western Cape, it is essential that the City’s residents are water-aware at all times, including once water restrictions are lifted, and that the City can act effectively to reduce and prevent waste. These amendments will assist the City to better protect our water resources so our City is more resilient when drought does strike,” said Cllr Limberg.